We offer constantly evolving innovations to help improve your options for developing skills within your teams, and to help prepare people to work successfully with all types of technology. Learn about our innovative approaches supported by HPE intellectual property, with unique benefits and proven approaches. Contact us to inquire for availability, as part of a tailored engagement from HPE Education Services. HPE has transformed traditional service management into a meta framework of best practices for governance and architecture, processes, and emerging technologies. HPE Hybrid Cloud Service Management not only helps organizations to manage the practices and processes for their hybrid IT and legacy environments, but does so in a series of sprints, resulting in faster time-to-value on the improvements. Many organisations are finding that their processes and governance structures were fit-for-purpose when designed, but now aren’t relevant to the new technologies they have adopted. HPE works with its customers to re-purpose their processes to fit their current environments. Flexible and scalable, HCSM takes a holistic approach, and encompasses the people and service management software components, as well as process design, ensuring end-to-end successful improvements. To stay competitive in the digital environment, organizations need to change how they operate and serve customers. It is an increasingly fast-paced and complex environment, requiring organizations to be more agile, better equipped to adapt what they do, and ready to adopt new ways of working to succeed. Through its framework, ITIL 4 helps organizations to connect and align these different challenges that are relevant not only to service management professionals, but also to a wider range of professionals working in the digital world. ITIL supports organizations and individuals to gain optimal value from IT and digital services. It helps define the direction of the service provider with a clear capability model and aligns them to the business strategy and customer needs. ITIL 4 is the latest version of the world’s most popular IT Service Management framework, it embraces new ways of working such as Lean, Agile and DevOps. 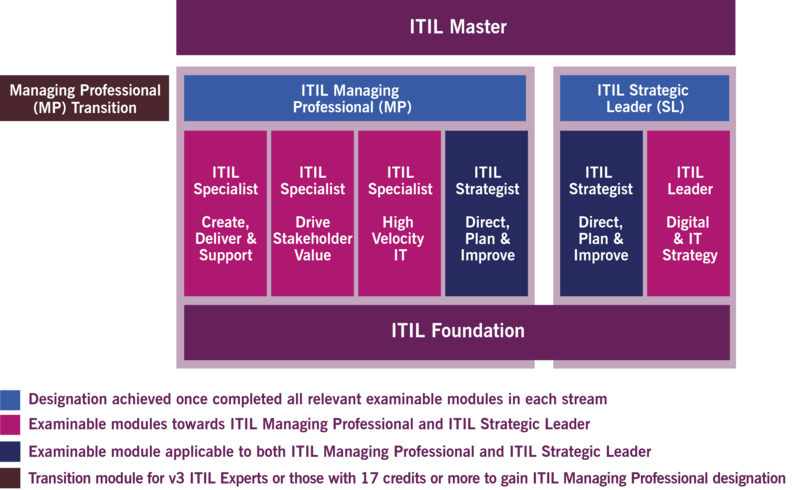 Get prepared for the digital world with ITIL 4 skills. Both of these courses will prepare you for the ITIL 4 Foundation exam. HPE is an Accredited Training and Approved Examination Organization. HPE is a market leader in technology training, as recognized by IDC for 6 years running. HPE has 3800+ staff who are ITIL certified and our experts are working with AXELOS on developing ITIL. When available, later this year the ITIL Managing Professional Transition module will have a 17-credit prerequisite. View the courses and enroll now for the HPE ITIL 4 Foundation and other ITIL training with exam to meet the 17-credit minimum you’ll need for the ITIL Managing Professional Transition module. HPE Visual Remote Guidance (VRG) is a secure, enterprise-ready collaboration solution that can boost productivity, increase efficiency, and decrease costs for your organization by using live visually-guided interactive sessions with extended teams. VRG enables phones, tablets, and hands-free wearable devices to connect via 3/4G or WI-FI, to the enterprise. Focused on support field services, VRG quickly connects a remote mobile workforce with subject matter experts to receive in-the-moment guidance, while also allowing interaction with vendors, partners, and other resources. As a result, VRG increases uptime and reduces overall cost, with fewer calls, shorter repair time, decreased travel requirements, and fewer parts sent onsite. This innovative, market-leading solution is offered in either cloud (SaaS) or hybrid on-premises architectures. For our HPE customers, technology transformation is almost universally held back by the readiness of people to operate in the transformed environment. Because people-readiness is crucial, many organizations that have embraced public cloud or a hybrid model to increase their agility and flexibility have also encountered challenges with their transformation efforts. In collaboration with HPE subject matter experts on public cloud, our Education Services team has built a comprehensive, continuous learning solution for our customers. This solution is comprised of learning paths created from 100s of cloud and hybrid transformation engagements, accompanied by the cloud platform and third-party tooling knowledge. Our team has pioneered the application of digital learning and digital community approaches to a specific set of transformation requirements that are integral to public cloud transformations. In re-thinking the problem, we examined digital delivery platforms. Our innovation is in how we organize community engagement, project communication, and learning information for our customers into 3 key components, all supported in the platform and by our best practice approaches. Social communities which are organized into teams, facilitated and guided by engaged project curators. Communications around all of the parts of the project for what is happening and why—the impacts on teams and individuals and the major milestones and KPIs of the project. Learning journeys for the major roles which are required for public cloud, defined into guided journeys with clear steps that include combined on-demand and live training opportunities, along with hands-on lab skills practice delivered from our virtual labs and third-party content. As part of the talent enablement approach, HPE Digital Learner™ platform provides a social community for team communication and learning guidance, tailored to public cloud transformation initiatives.